Old clocks may include mantle clocks and grandfather clocks. Most antique clocks have similar mechanisms that run in synchronized format. If one part isn't working, the rest of the clock may not work or will function poorly. It is important to maintain and fix a clock with problems. Mantle clocks have a pendulum that ticks back and forth, or a balance wheel, to regulate time. Most repairs are done internally for mantle clocks. 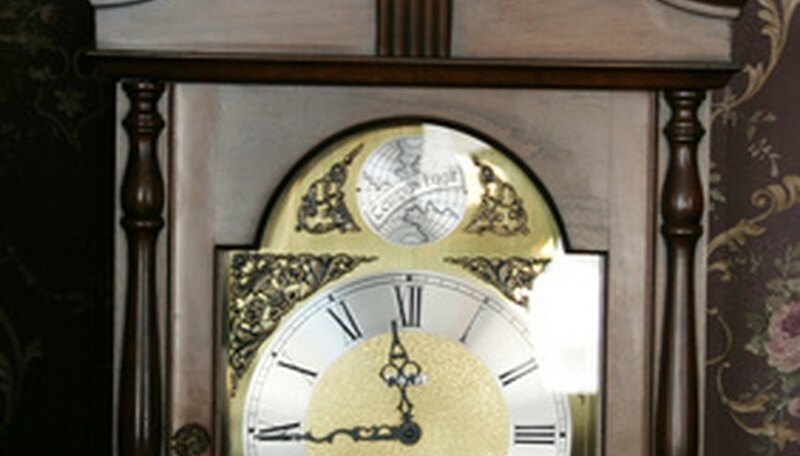 Grandfather clocks are elongated, and have hanging mechanisms in the front that may need to be adjusted. Check to see if the pendulum weights are pulled up on your grandfather clock. Sometimes all that is necessary to allow the pendulum on the clock to swing without interference is an adjustment of the weights. Make sure that the weights are in the right place. Look at the weights to see where they are labeled: left, right or center. Adjust them accordingly if they are tangled. Make sure the grandfather clock hands are not touching one another. If the hands are touching, they may stop the clock, and may interfere with the inner mechanisms functioning properly. Look at the hour hand, which is the larger hand, and the smaller minute hand. Push the hour hand gently toward the dial to clear the minute hand. Do not push too hard or else the hour hand will touch the dial. Bend the minute hand to you slightly, if they continue to touch. Be careful not to break the hand, and make sure that the grandfather clock hands do not touch the dial glass. Adjust the pendulum bob if the clock runs too fast or slow. Push the bob up, to run the clock and pendulum faster, or push it down, to slow the pendulum on the clock. Set the moon clock dial next. Press gently against the moon dial, while rotating the dial to the right. Examine your mantle clock. Open the back door of the clock carefully with a small screwdriver. If no pendulum is attached, your mantle clock may be regulated by a balance wheel, which is operated by a spring. Check to see if the spring is in working order. Wind the spring as far as it will go. If the clock has a pendulum, swing it by hand gently to one side. The clock should work after making the spring adjustments. Try oiling the spring in the pivot areas with clock oil if the clock ticks too slow, or if the spring has not been oiled in a while. Antique clocks should be oiled at least once every three years. Linda Stamberger began writing professionally in 1994, as an entertainment reporter for "Good Times Magazine." She has written online copy for The Volusia Community website and is the author of "Antiquing in Florida." Stamberger studied creative writing at Southampton College, where she won a partial writing scholarship.